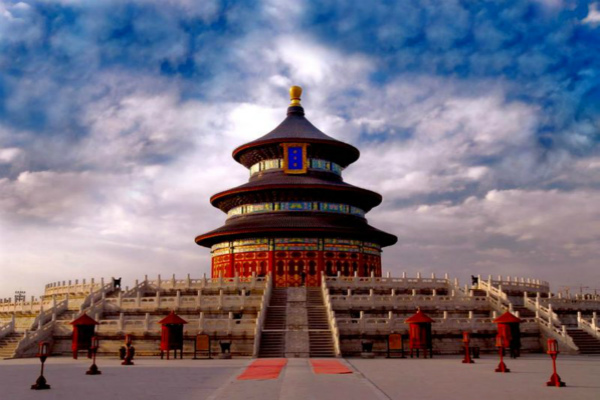 The Temple of Heaven was built in 1420 during the reign of Emperor Yongle of the Ming Dynasty. Situated in the southern part of the city, this grand set of structures covers an area of 273 hectares. To better symbolize heaven and earth, the northern part of the Temple is circular while the southern part is square. Two walls enclose the whole compound, a square wall outside a round one. The outer area is characterized by suburban scenery, while the inner part was used for sacrifices. The inner enclosure consists of the Hall of Prayer for Good Harvest and the Circular Mound Altar. 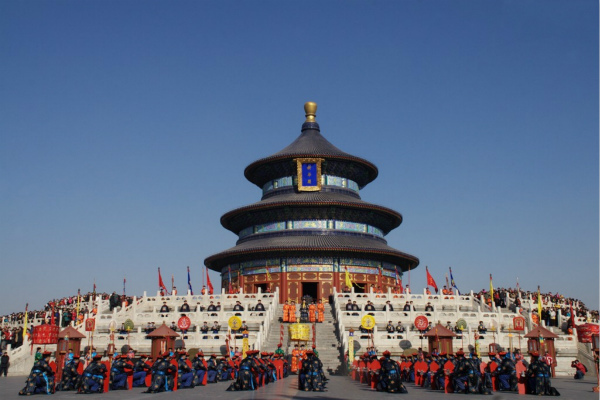 Today the Hall of Prayer for Good Harvest is the hallmark of Beijing, which enjoys a prolonged history of civilization. The annex halls were symmetrically built on a 1.5-meter-high brick-and-marble terrace, to set off the loftiness and magnificence of the main hall. This unique building, 38 meters in height, is characterized by a cone-shaped structure with triple eaves and a top that is crowned by a gilt ball. The roofing is made of blue glazed tiles, the color of the sky. Underneath the roof, the beams and brackets are decorated with colored paintings. The base of the structure is a triple-tiered, circular marble terrace. At a distance, the terrace looks like a gigantic, spiraling cloud with the structure perched on top of it. The Imperial Vault of Heaven is the main structure of Heaven's Storehouse. Aside from exquisitely laid out architectures, Heaven's Storehouse is also famous for two structures with peculiar acoustic features, i.e. the Echo Wall and the Triple-Sound Stone. A mere whisper at any point close to the wall can be heard clearly on the other side, although the parties may be 40 or 50 meters apart. This is possible because the wall is round and hermetically constructed with smooth, solid bricks. 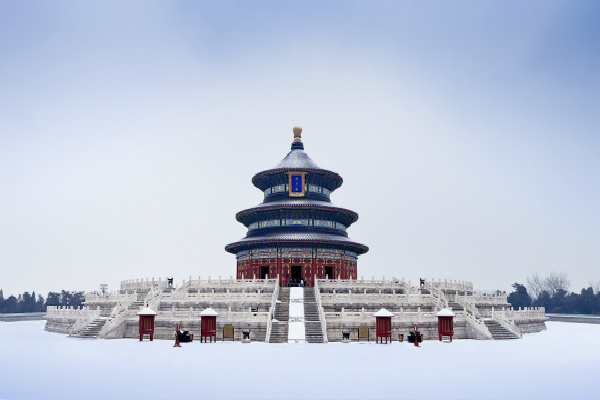 The Temple of Heaven is also famous for its cypress trees - there are more than 60, 000 cypress trees in all, among which over 4,000 are more than one hundred years old, adding to the solemn atmosphere of the temple.